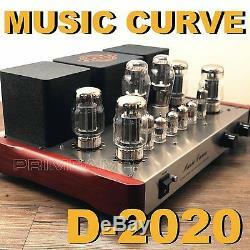 MUSIC CURVE D-2020 KT88 x4 Push Pull Hi-End Vacuum Tube Integrated Amplifier. The power transformer and output transformer adopts and impost the silicon steel sheet (thickness: 0.35mm) of audio frequency and high-quality wire of high strength and winds the crafe of making specially. 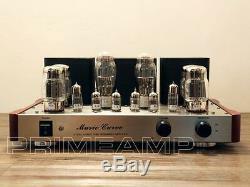 All resistors and capacitors are audiophile grade to ensure sound quality. German red polypropylene capacitors for coupling effect. Gold costed RCA connectors plus 4 ohm and 8 ohm loudspeaker outputs terminals. Brushed stainless steel chassis (thickness: 1mm), with all metal buttons and knobs, lus blue LED indicator light. The side panels feature lovely shaped and refined cherry wood. Classic parallel Push-Pull circuit equipped with the famous KT88 tubes, this thing produces nothing but beautiful, gorgeous music. It is fit for listen to all kind of music. Side panels made from cherry wood. Input Sensitivity: 500 to 3000mV. Frequency Response : 20Hz 30KHz+/- (-1dB). Maximum Output : 30W Per Channel (8? 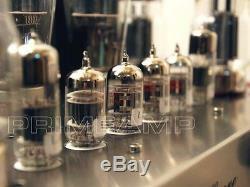 Tubes for Preamp : 12AT7 x 2, 12AU7 x 2 6N6T x 2. Tube for Rectifying : 5Z3PA x 2. 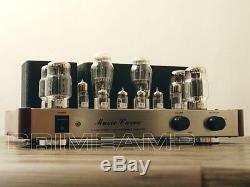 Power Tube : KT88 x 4. Supply Voltage: AC 120V 60Hz/50Hz. Size Dimension: W 460cm x H 180cm x D 360cm. Please make sure you checks there is not hidden change for some other. We will properly pack each item with sufficient protections to ensure it reaches you in the same condition as when it left our warehouse. International Buyers - Please Note. We Guarantee 100% brand New. But please allow us 12-24 hours to respond. PRIMEAMP And TUBESTEIN is a reputable Hong Kong based importer & exporter, specialize in wide range of electronic devices especially on tube amplifiers, we are well connected with some famous brands: Yaqin, Music Angel XDSE, Bewitch, MHZS, AUDIOROMY etc. We are trading as a worldwide wholesaler and retailer with excellent product knowledge; our marketing and sales department promise to provide well-rounded customer service and reliable after-sales service. With the advanced technology and staying at the forefront of new innovation, and the support of customers from Hong Kong and overseas, we provide the best services to our customers to gain the highest satisfaction in on-line electronic Services. 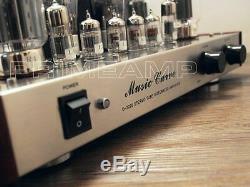 YAQIN MC-100B GB KT88 x4 Vacuum Tube Hi-end Integrated Power Amplifier 110v-240v. 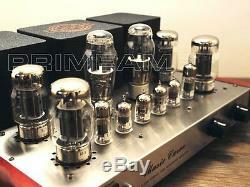 Music Angel MENG EL34 x 4 MINI L3 Vacuum Valve Hi-end Tube Integrated Amplifier. 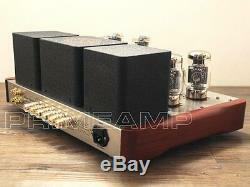 YAQIN MC-100B SV KT88 x4 Vacuum Tube Hi-end Integrated Power Amplifier 110v-240v. 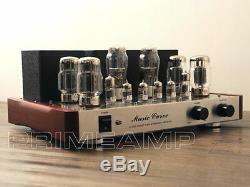 XiangSheng 728A BK Vacuum Tube Pre-Amplifier Preamp Shigeru Wada Japan circuit U.
YAQIN MS-12B MM High End 12AX7 Vacuum Tube Pre-Amplifier / RIAA for turntable. Yaqin MS-90B KT90 Vacuum Tube power n Intergrated Amplifier Bluetooth 110v-240v. Yaqin MC-100C KT88 Vacuum Tube power n Intergrated Amplifier Bluetooth 110v-240v. 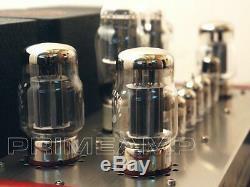 Shuguang China 1 x 6N9P 6SL7GT 69C Valve Vacuum Tube 1PCS For Tube Amplifier US. 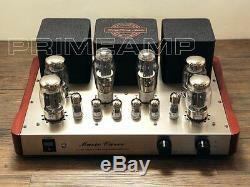 Shuguang 12AU7 / ECC82 x 2 Replacement Vacuum Tube Valve Pre-Amplifie GUITAR AMP. 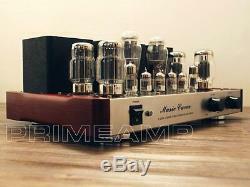 YAQIN MS-650L 2A3 PUSH 845 Vacuum Tube Power & Integrated Amplifier 110v-240v. 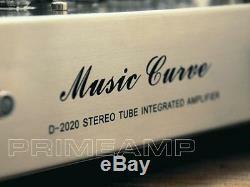 The item "XiangSheng MUSIC CURVE D-2020 KT88 x4 Push Pull Vacuum Tube Integrated Amplifier" is in sale since Friday, June 16, 2017. This item is in the category "Consumer Electronics\TV, Video & Home Audio\Home Audio\Receivers & Amplifiers\Amplifiers & Preamps".